On the occasion of our tenth anniversary, the Choutari editor, Jeevan Karki has collected the reflections from our founding/past editors and readers. Their reflections remind the readers the ups and downs in our journey, our contribution (contribution in education in general and ELT in particular), contents and readers perspectives on them, its sustainability, some valuable suggestions and most importantly its recognition around the world. It’s indeed very interesting to hear from them and we believe you will certainly enjoy these excerpts and know more about Choutari. Choutari for a decade has been a good writing zone for professionals and writing enthusiasts. It has been supporting to promote writing habits. It has been a transition point for formal writing and highly academic writing, where writers can express themselves more casually. Moreover, it has also offered a platform for researchers to share their reflections. Interestingly, it is helping to review the teacher-student dichotomy. In the past, only teachers used to teach or write and students used to study or read but now students are also writing and teachers are able to read their students through the means like ELT Choutari. Besides, Choutari is helping to generate the content on ELT and teaching-learning and education in general. The content published on Choutarih as been used in the course of B.Ed. third year in critical reading as well. It’s covering the ELT practices and experiences, ideas for professional development, and discourse on contemporary issues. This writing and discourse revolve around the ELT practitioners from Education faculty mostly. Therefore, now it should also cover and include the ELT practitioners from the stream of Humanities in order to back up and view the ELT practices using critical theories. It may be high sounding but Choutari should think about collecting advertisements from the nation and regional publishers. So that the fund could be utilized for the better design of the site, to conduct writing workshops, interaction, talks and also for some full-time editors/reviewers to value their time and effort. Likewise, it can also be used for paying for well-written articles, which could enhance the quality of writings on the magazine. Likewise, it should also establish the direct connection with the graduate and postgraduate students through teachers to encourage, guide and mentor them in writing, like the way the theatres in Kathmandu do with the students in the university/campuses. “Several of us NELTA members . . . would like to share with you a few materials related to ELT on a monthly basis,” said an email from Balkrishna Sharma, who signed the email along with Prem Phyak’s name and mine. “Our desire is to prompt some ongoing discussion on issues of interest in ELT,” he added, inviting ELT colleagues in Nepal to discuss, in NELTA’s Yahoo listserv, the texts and ideas we planned to share. That was exactly ten years ago today. A child who was born a few months earlier just had a robust conversation with me about “social justice” as a theme that he looks for in movies that he considers worth watching. An excerpt from Paulo Freiere’s Pedagogy of the Oppressed was one of the three items we had shared for discussion in that first “issue” of [N]ELT[A] Choutari (we were asked to stop using “NELTA,” the acronym of an organization we call our professional home, when its leadership wasn’t, for some time, driven by the positive energy that it used to be). I think that Choutari remains that free spirit, a monkey wrench in a hierarchical socio-epistemic culture. For me, Choutari is a simple social phenomenon: an additional space born out of the need of younger educators, passed on and changed, and often almost gave up but never stopped using—just to make their voice heard as emerging, passionate scholars. I’m sure that new generations of our language scholars will continue to use this platform, helping themselves and many more to pursue the profession. We had started Choutari to connect ELT professionals virtually and engage them in critical and situated discussions on multiple issues related to ELT. In the beginning, we published Choutari as a monthly blog to share NELTA activities, events and thoughts of NELTA colleagues. Mr Ganga Ram Gautam, the then President of NELTA, supported our team. I was Secretary of NELTA during that time. We received passionate support from NELTA central committee to publish Choutari. In 2012, NELTA decided to publish its own blog so we changed the name of blog NELTA Choutari as ELT Choutari. Choutari is now an independent and journal-like space where research articles, personal reflections and thoughts, workshop ideas and other ELT related discussions are published. I am happy to see the growing number of Choutari readers and feel proud that Choutari articles have contributed to expand the existing ELT knowledge by creating space for critical discussions on various issues in the field of ELT. Choutari articles have been cited by the authors from around the globe–this is very exciting indeed. For me, Choutari has become a popular name and a common space for Nepalese ELT community of practice to share personal and professional stories, research and ideas with scholars at the global level. Earlier up to my bachelor level, I was unknown about ELT Choutari but when I came to Kathmandu for my master’s degree, I came to know about it. Since then, I’m enjoying with its contents regularly. As a reader, I found this forum as a good resource bank with fresh ideas regarding the current issues and practices of ELT. Sharing and discussing such practices and experiences have really become beneficial for ELT practitioners and beginners like me to be professionally strong. Because I can find some reflections there, some innovative practices, latest trends of ELT around the world, national and international perspectives, which would keep me abreast in my field. Choutari has brought opportunities to know about the recent trends and practices of ELT staying at home using our own smartphones and other digital devices. For example, the article by Yashoda Bam (October 2018) entitled “My Experiences of Teaching reading in Secondary Level” helps all teachers to deal with problems that they face in the course of teaching in the same level. In the same way, the interactive blog post by Ashok Raj Khatri (July 2018) entitled “Writing Practices in ELE Programs in Nepali Universities” in which the participants (lectures of different universities) have mentioned the fact that research and writing has been an integral part of the curricula in the universities but the practice is different in the universities. The striking point in this post is our degree is unable to develop our writing habits for this or that reasons. Finally, I feel that Choutari should organize workshops and interaction programmes for the emerging ELT practitioners like us to have more ideas on framing topic and producing publishable writing, which the university degree has never taught us. Usually, I go through almost every issue of ELT Choutari since I came to know about its website. I mostly pause to read the contents like the discussion on classroom practices, the novelty in lesson delivery, and interview of different scholars on the issues like language development, aspects of language and use. I also love the articles written by new writers on language issues. I mostly prefer reading the experiences of the teachers from various corner of Nepal. I really enjoy reading them as they brought genuine issues/problems and way forward from their classroom practices. Since their experiences are based on real practices, it offers a wide range of knowledge about the challenges faced in teaching language in the schools of Nepal. Equally, I do love to read scholars’ interviews as they pass the message to the readers about the national and international perspectives of teaching-learning, professional development and so on. To sum up, I would like to suggest the editorial team to involve a wide range of contents like teaching English/Nepali and other languages in primary grades, review of curriculum, practices of the directions and provision of the curriculum in the actual classroom teaching-learning. Equally, I love to see the editorial team starting discussion programmes among the teachers to share their experiences. Finally, it should start uploading real classroom delivery videos too. Generally, pedagogical capital is the capability of teaching effectively to the learners by applying various methods and techniques such as pair work, project work, group work, power-point presentation, etc. In this reflective narrative, I will share my journey of gaining pedagogical capital as an English teacher while also aligning my reflection with the available literature. It is very hard for me to visualise how teachers would come to my classroom when I was schooling but when I joined higher education (+2), I found my English teacher having an attractive outlook. Perhaps, I thought, a very impressionistic ideology he had. He would immediately start delivering his lectures. The classroom would be pin-drop silent, he was only the all-in-all inside the classroom. There was no autonomy of questioning in the classroom. After my +2 graduation, I became a private school English teacher. Since I was guided by my teacher’s philosophy, my prior focus remained on how I could be the best kind of teacher as my teacher was. I practised the same practice I learned from my mentor. My classroom would also be silent because I wanted to be as strict as my teacher was. Later on, when I was called by the school principal to report the student progress and achievements, I had no words to explain. I tried my best to know how to teach but I never tried to know how they would learn better. Then, I realised that I did not facilitate them to put forward their views and also I did not encourage them to practise in a pair or in groups. I became quite aware of the philosophical construct of Lovat (2003) who quotes pedagogy as ”a highly complex blend of theoretical understanding and practical skill” (p. 1). More specifically, I envisaged theoretical ideas into my classroom to reflect my own practice blending different assets of language teaching in the context of Nepal. Finally, I realised that the conventional practices of teaching and learning were counterproductive in my classroom because my teaching hardly transferred knowledge, rarely practised innovative thoughts and didn’t use internet sources and electronic devices to facilitate learners in the digital era of 21st century. I knew technology facilities to my learners would increase their learning habits. Moreover, it is primarily expected to use power-point presentation, bring online mode of learning and practise technology blended teaching-learning activities in the 21st-century classroom. Enriching teachers’ experiences and shaping the way we do is always embarking on behalf of the learners. I experienced there must be mutual understanding, positive attitudes, pedagogical reasoning for every teacher, thereby; they can offer various effective strategies in their classroom. As I already confessed that I didn’t allow my students to make noise in the classroom. I either facilitated them to practice in group/pair or encouraged them to work in projects. I hardly paid proper attention to the sitting arrangement of the students in the classroom. Time passed by, I happened to consult various e-sources and learned various activities to empower my students. I made them work in groups. Every weekend I organised cyclical sitting arrangement. I realised cyclical sitting arrangement would really foster positive vibrant in lower level. I also tried to bring innovative ideas of language games and strategies. More specifically, I facilitated them with ‘Chaining Stories’, ‘Word Linkage’, ‘Essay writing’ and ‘Storing Vocabulary’ etc. to improve their language learning proficiency in lower level. I consulted different websites and pages such as ‘Coursera’, Learn on Demand’, etc. to practice in the higher level classroom. I realised blending the philosophical notions and the theoretical praxis could be the innovative ways of empowering learners. I also realised that I had not gained much pedagogical capital during those days. I experienced that the philosophical constructs of teaching have not only been the notion of bread and butter rather it has been the aesthetic part of human life. Teaching, in some point of time in history, was taken as absolute phenomena. The teacher would be all-in-all. The teachers were treated as the great persons who deserve to know everything and their every advocacy would be correct in spite of the fact that they were wrong. But unfortunately, it does not currently exist. In course of my learning as a teacher I linked the two terms Pedagogy (comes from education) and Capital (comes from the economy) to recapitulate its cognitive layer and the educational intelligibility. More specifically, I explored as to how I gained the greater amount of exposure to contribute to my storehouse. I began theorising any asset an individual owns is capital since there are different forms of capital such as economic, human, educational, pedagogical, professional, materialistic, cultural and symbolic, etc. Bourdieu (1998) claims that economically any property an individual owns is economic capital and any educational asset which an individual owns is educational capital. Therefore, for me, pedagogical capital refers to the profound knowledge that a teacher gains in his/her subject. Thus, I envisaged that the teaching and learning activities are always grounded on the belief system of teachers where their perceptions, knowledge, and realisation become the key components to impart knowledge in favour of the students. So, I questioned myself about my own profound knowledge about subject matter. I also experienced different types of problem and employed some strategies to overcome students’ problems in the classroom such as guidance and counselling, focusing on practical activities, motivation, and encouragement, raising awareness, and telling success stories, etc. I also developed sharing culture among and between students. In doing so, the students at the lower level had to share their diaries and students at the higher level had to share their experiences or success stories or other events. Realising the classroom culture, I developed classroom planning. I designed communicative activities to improve their communication skills in lower level and games to teach content effectively. Moreover, in case of a higher level, I began teaching using power-point slides. I stopped my lecture method and initiated student-centred approaches in which students freely put forward their views and understanding. I divided the whole course content among students and asked them to prepare and present themselves, which resulted in the main benefits for them. The first is to know about the content in detail and the second is to learn presentation skills in a standard format at the higher level. I began guidance and counselling as positive tools at the higher level. For adult learners in higher level, I very often motivated them towards their study. I provided plenty of reference materials for my students collecting from different sources. Munro (2007) emphasises that the pedagogical knowledge base of teachers includes all the required cognitive knowledge for creating effective teaching and learning environments. I realised if I needed cognitive skills to teach my lessons. Following Yousif and Aasen (2015), I considered teachers as the analytical thinkers and realised that they have a crucial role in their professional life. Eventually, I got opportunities to teach at university campuses and I learned teachings from professional forums, conferences, seminars, workshops, etc. to develop the proficiency of my students. I not only followed what my mentors did but also I practised innovative styles to contextualise in our Nepali classrooms. I gradually joined several online groups such as Facebook group, internet channel, skyping, twitter, blogs, etc. I integrated cell phone in the classroom teaching at a private institution. It was a great challenge for me, however, I was able to convince the campus administration. It really helped me empower my students and self to grow professionally. Moreover, there were some issues left to address. Ahmad et al. (2012) argue that classroom teaching has issues not due to the learners alone but due to the lack of the teachers’ competency to create the setting, to decorate the classroom appropriately and to speak to the children clearly and to respond to their questions. Due to teachers’ pedagogical richness, they very often address the issues in the classroom but sometimes they fail to address those issues because of different circumstances. Of course, I realised students had different problems such as psychological, linguistic, physical, disciplinary, academic, etc. Additionally, I confronted with different issues such as classroom setting arrangement, students’ disruptive behaviours, teachers’ lack of planning and preparation, etc. in the classroom. For addressing classroom issues, I repeatedly used guidance, counselling, motivation, threat/treat, encouragement, focusing on different practical activities, technology-oriented teaching, student-centred approach, sharing success stories and experiences, etc. Thus, I understood a pedagogically enriched teacher is to have content, confidence, continuation, collaboration, coordination and technological awareness to grow professionally. Therefore, I earned my pedagogical capital rationalising the huge evidence of my own learning as a student and a practitioner teacher. I implemented my own pedagogies succinctly, for example, preparing proper lesson planning before going to the classroom, consulting my seniors and various sources and being updated and upgraded in my own repertoire. I fundamentally valued teachers’ pedagogical knowledge which includes teaching, learning, curriculum, and assessment, etc. Thus, I didn’t impose my vested interest on students because I knew my increasing experiential knowledge would help me disseminate content better day by day. In course of my teaching journey, I gained actual knowledge of English language and how to teach the language. Moreover, I perceived the use of different methods/ strategies enable teachers to be determined, rigorous and professional. I am with those teachers who consider the internet as a good source of learning. Teachers’ technological awareness and experiences help them apply modern pedagogies in the classroom. It is believed that experience contributes to one’s pedagogical storehouse. Teacher’s self-reflection develops their pedagogical capital. *Ganesh Kumar Bastola is an M. Phil graduate of Kathmandu University in English Language Education. He is a teacher, teacher educator, and researcher and translation practitioner. Ahmad-Shaari, M. Z., Jamil, H., & Razak, N.A. (2012). Exploring the classroom practices of productive pedagogies of the Malaysian secondary school geography teacher. Review of International Geographical Education Online, 2, 2. Bourdieu, P. (1998). Practical reason: On the theory of action. California, CA: Stanford University Press. Lovat, T. J. (2003). The role of the teacher coming of age. Australian Council Deans of Education. Discussion Paper, 2003. Munro, J. (2007). Pedagogical capital: An essential concept (and tool) for effective school leaders. Seminar paper. Jolimont, Vic. : Centre for Strategic Education. Yousif, A. H., & Aasen, S. F. (2015.). Ways of making teachers’ pedagogical capital visible and useful. Journal of Workplace Learning, 27(5), 332-344. The main purpose of most language courses today is to facilitate communication in the target language, formulating a successful and effective lesson plan becomes indispensable. The idea of how to prepare a successful and effective lesson plan fundamentally depends on the alignment of assessment activity with the objective(s) of a lesson plan. This piece of writing deliberates on the different parts of effective lesson design and assessment and keeping the discussion into consideration, a sample of lesson design and assessment has been provided. Even though the current discussion focuses on the classroom teaching activities at the tertiary level, the same lesson plan and assessment can be applied in other classrooms at different levels with minor adaptation. Firstly, an ELT (English Language Teaching) professional needs to have a clear picture of putting those actions words/verbs that would fit his or her in the portion of the lesson objective(s). In addition, he or she needs to know that his or her lesson plan objective encompasses a clear statement of measurable outcomes which can be achieved by providing action words, such as ‘identify’, ‘state’, or ‘demonstrate’, not words like ‘comprehend’, ‘feel’, ‘learn’, etc. since the latter cannot be measured or evaluated. Furthermore, an ELT practitioner needs to have knowledge of an effective warm-up activity and its objectives. Then, he or she needs to investigate whether his or her warm-up activity makes an attempt to get students’ attention, recall of prior learning, and introduce new ideas and connect these ideas to the past learning. Likewise, an English teacher (ESL/EFL) also requires to include objectives, which consist specific aims of the lesson. Moreover, an EFL/ESL teacher needs to have knowledge of “instruct and model” while formulating his or her lesson plan; under “instruct and model”, he or she needs to apply the use of teacher talk, to know how to keep things conversational, and to employ activities that would make the instruction sticky (memorable, usable, durable). He or she necessitates having the knowledge of either using traditional modelling (teach, model, question) or inductive reasoning (model, infer, elaborate). In addition, we as English teachers require to understand the importance of “guided practice” and “independent practice” that would be included in our lesson design. Under “independent practice”, English teachers (EFL/ESL) should check and allow students to show that they have understood the instruction provided by the teachers. Finally, under “assessment” activity, an ELT practitioner needs to check that his or her assessment activity is aligned with the objective, and the assessment activity is authentic (The situations, where the students are placed in during the assessment, are as similar as possible, to situations they may encounter outside the classroom). Now, here is a sample of such a lesson design and assessment to have a better understanding of the ways that could be employed while formulating a lesson design and assessment. Objective: Students will be able to use the simple past tense to describe and write a paragraph describing their travelling experiences in Bangladesh. A warm-up activity: I would place some pictures of attractive and historical visiting places of Bangladesh on the whiteboard E.g. the pictures of St. Martin Island of Bangladesh and the Red Fort of Mughal Empire in Dhaka city. Then, I would show the video clip of “beautiful Bangladesh”, prepared by the government of Bangladesh. I would mention the pictures of other places we discussed in our previous class to relate to the previous lesson. Then, I would ask my students whether they can recognize the pictures and places of Bangladesh and provide positive feedback to those willing to speak. Asking questions is one of the ways of triggering the recall of prior knowledge; thus, it would bridge old to new information. “The world is a book and those who do not travel read only one page”. Advanced Travel The world is a book and those who do not travel read only one page. Agree or Disagree? I would write a phrase ‘travelling experiences in Bangladesh” and ask them (by getting their feedback) to relate the discussion of some beautiful places of the previous class. After that, I would ask them whether their experiences were pleasant or bitter. I would mention the probable reasons for having mixed experiences and concerning issues, like safety, accommodation, food problems and so on. I would make some groups and ask them to discuss various points among themselves and come up with answers by brainstorming. Likewise, I would record their answers on the whiteboard and offer them feedback. I would mention that we were going to discuss more on the travelling experiences in Bangladesh and write in a paragraph ensuring there is the topic sentence, supporting details and concluding the sentence. I would ask my students whether they would like to go abroad for their further study. If they would like to, they need to sit for international language testing systems (e.g. IELTS, TOEFL) or any other competitive tests for the job search in Bangladesh. In these tests, they need to write some paragraphs. Then I would motivate them my writing class would be helpful for them to learn the structure of paragraphs (*this is important for the objective) and practice developing good paragraphs. I would tell my students that they are going to learn the basic structure of paragraph writing and provide them with a model of a narrative paragraph with topic sentence and three supporting details with the use of transition words, and finally, tell them about the concluding sentences. The model would help them to internalise the structure of the paragraph. (*This is for specific details/instructional objectives). I would ask them whether they can relate or differentiate the structure of the previous lessons and the present one. I would mention here about the structure of other types (for example, descriptive or cause-effect type of paragraph writing) of a paragraph in from the previous lessons. Then, I would ask them if they would be able to differentiate between or among the types of structures of paragraph writing (*this is for the check for understanding). Even though I would prefer using the inductive reasoning (model, infer, and elaborate), I would wait for quite some time to see whether my students would be able to grasp (wait for an opportune time) before providing the models of the paragraphs. First, I would tell them a very popular folk story about a king and his four daughters (narration of a story is to keep things conversational). I would ask them whether they could come up with any structure of the story. I would note the responses on the (teacher talk: using board work to introduce the topic). I would clarify that a story generally has a beginning, middle, and ending; so does a paragraph have (use of analogy). I would repeat those key sentences and check their understanding (teacher talk: repetition). I have chosen the story keeping the objective of the lesson plan in mind. The story uses the past tense; as I am going to focus on the use of past tense in the paragraph writing. After that, I would show my students some of the models of paragraphs using multimedia and I would also give them hard copies (photocopies) of the models of paragraphs (more than one) from the Book by John Langan (part of teacher modelling) to my students, and also my prepared samples of paragraphs (‘Sharing your own work so that students can see what you have done’ is a part of teacher modelling) for suiting the learning of past tense and a structure of a paragraph. I would ask my students whether they can see any beginning, middle, and a concluding part of a paragraph (the analogy is a part of teacher talk). I would provide them copies the model of paragraphs and form some pairs or groups (‘Giving students a problem to solve in pairs or groups’ is an example of inductive reasoning) to do the brainstorming to figure out the structure of the paragraph. Topic sentence of a paragraph: the main idea of a paragraph is known as a topic sentence. The two parts of a topic sentence is called subject and the controlling idea. Concluding sentence: the paragraph is summarized with a concluding sentence. In this part of the paragraph, a new concept or idea is not introduced but the idea the topic sentence is rephrased using the transition words. I would also mention or elicit the importance of using transition words, such as using ‘firstly’ with first supporting point and ‘secondly’ with second supporting point and ‘finally’ with concluding sentence (sign post expressions). I would ask my students (‘asking questions’ is a part of teacher talk) whether they can compare and relate the three things mentioned in the story and in the models provided. By asking questions, I would check whether they have understood my elicitation (‘Elicit reactions and responses from your students’ is a part of keeping classes conversational); even sometimes students say that they have understood, I would repeat (‘clarifying and elaborating when students don’t understand’ is part of teacher talk). My experience shows that repeating the same concept more than once help students remember the concept better and use for a long time (As the learning sticks, it becomes usable and durable). All through my lecture, I would use warm language and speak clearly if any of my students fail to understand. Since I would be working on a paragraph writing unlike an essay writing, I would pick up the three parts (topic sentence, supporting points and a concluding sentence) of a paragraph writing as a whole under my guided practice in the class. Firstly, I would mention “A topic sentence is”, and ask one from one group of my students to complete the required information of the sentence, and then I would inform “there are three supporting points in a paragraph”, and invite others from other groups of students to complete the three supporting points. The same goes for “the concluding sentence” (A teacher-led activity includes responses from a variety of students; it also encompasses starting a sentence and inviting students to complete the sentence). For each correct response, I would give them “thumbs up” and encourage them to speak more if they would be able to add up more information. After that, I would divide my students into different groups, and I would provide some samples of topic sentences (without three supporting points and concluding sentence-‘backwards fading’) to one group (group 1) and some samples of paragraphs with topic sentence and three supporting points without concluding sentence to other three groups (group 2, 3 and 4). Under the instruction and model section of lesson template, I have already provided the models of a structured paragraph to all my students. As the strength of my class is around 30, I would make 5 groups. I would ask my group 1 to deal with a topic sentence (to discuss the two parts of a topic sentence; the subject and the controlling idea). Then the other three groups; 2, 3, and 4 would deal with each of three supporting points (the use of transition word and the idea that supports the topic sentence), and the group 5 to discuss on the concluding sentence of a paragraph (to come up with the idea of rephrasing the topic sentence and use of transition words, and not to introduce new concept or idea again). I would give low-performing students the most difficult task under each group and ensure that groups are of mixed levels and abilities. While my students are working on their assigned task, I would go round the class, observe, and ask them to see if they needed any support. (‘Walking around the room, checking work and answering questions’ are known as facilitators of independent practices). I would make sure that each group would have a scribe to jot down the summary of their discussion, a spokesperson to present the summary of the group work and a controller to ensure that everybody is taking active participation in the group activity. I would give 10 minutes for each group to discuss and prepare for the presentation and give three minutes to present their work. I would ask each group to present their work in the class (students give a presentation relating new information to the class’- an example of independent practice activity). After finding that they are able to get the fundamentals of the structure of a paragraph, I would ask each student to write a paragraph on their travelling experiences abroad (or different places of Bangladesh or similar topics) as home task, and they would make sure that their experiences and writing would be different from one another. Then I would ask them to submit their home tasks in my pigeon hole one day before the next class (Generally, in my institution, students get one or two days break before the next class). I would check all the home tasks before going to my next class. I would provide feedback on the written tasks and discuss any improvements required for them (with positive and motivating words). In addition, I would ask them to submit their write- up again at the end of the class. From the objective of my above lesson, it can be gauged that the lesson assessment would relate to knowledge learning, not memory learning (recalling). The objective of my lesson plan is to teach my students how to write a paragraph, so I would provide them the actual model of a paragraph in my assessment before the final examination; as a result, this task would be authentic and require them to apply their learning of writing the paragraph. By doing this, I would be able to assess that students should be able to transfer classroom knowledge to the real world; for example, at the time when they would go for different examinations in writing paragraphs in English. Instructions: Write a paragraph within 150 words on the basis of the outlines provided. You will have 15 minutes to complete the task. I had experienced some wonderful memories while travelling the picturesque island of Saint Martin in Bangladesh. (Topic sentence). Firstly, (the first reason) —————————————————————————————————————————————————. Secondly, (the second reason) ——————————————————————————————————————————————————————————————. Finally, (the third reason) ——————————————————————————————————————————————————————————————————-. Moreover, (concluding sentence) ——————————————————————————————————————————————————————–. This type of assessment would help us understand that the students would have higher order thinking (analyse, evaluate and create) since such as assessment requires them to talk what they know about a topic, and what the structure and organisation of a paragraph, and combine the two into a coherent product. I would also provide them with a scoring rubric for a paragraph writing; as a result, they would be able to have a clear picture of how their work would be evaluated in their final examination. Time passed by, I changed my school and went to the district headquarter to continue my study because of Nepali Civil War (10 years internal conflict between the Government of Nepal and the Communist Party of Nepal (Maoist).When I started my new educational journey in a new place, I had no friends with whom I could share my feelings and emotions. I experienced different facets of life .I had an old radio bought by my Kokpa (Grandfather) as a means to spend time with. I started tuning radio regularly and soon felt that the radio had become my best friend. I came to know about different innovative ideas such as child rights, child marriage, and mensuration hygiene from the radio. I tuned in radio from the morning to the late night in order to collect information. I became huge fan of Radio Kantipur during those years because I liked the ways the Radio Jockey (RJ) presented programmes. More specifically, I was impressed by their commanding voices. However, the English programmes attracted me more because I enjoyed the English speaking style of the RJs. I especially liked their pronunciation, speaking styles, confidence etc. Then I started dreaming of being able to speak like them and started tuning English programmes even if I did not fully understand what they were /talking about. However, I loved and entertained all the programmes believing that if I tune in English programmes regularly, one day I would be able to understand fully and be able to speak English fluently .So, I thought that at first I should learn vocabulary to speak or understand English. My Aapa (father) used to tell me that good command on vocabulary of any language is essential for language learning. Then, I started making note of some English words and expressions and consulted dictionary for the meaning. Similarly, I started consulting the seniors and school teachers for the new words and expressions. They suggested me that regular writing and learning new words can be a good way of learning. As a result, I attempted writing my thoughts and feeling in English as simple as I love my family, I like to watch TV/ Movies. This is my favorite color, place…etc. But I didn’t try speaking because I thought, first writing would be easier than speaking. My eagerness of learning English became stronger even if I was very young, I used to think that if I speak fluent English I will get good respect and love in our society. It was because people having confidence in English were treated respectfully in our society. I felt English teacher was one of the most respected and prestigious persons for students and parents rather than the subject teachers of Nepali, Social, and Population. By the time being, , I decided to study English as a major subject in college dreaming of being fluent English teacher because I understood being English teacher is to get reward respect and love (However, now I think, that I was too much inclined towards English because of the perception of the society. Now I feel that, all languages and teachers are equally important.). In the thought of excelling in English, I used to ask a lot of questions to my elder brother in English at home, which would annoy him sometimes. At night, I used to keep radio nearby me and tuned in in low volume and to my surprise; it used to go talking the whole night! In this way, Radio had been my friend and coach which not only supported me to learn English but also taught different life skills. I learned new words and pronunciation via radio. Most importantly, the loveliest thing, I learnt is listening to others speaking fluently in English. I sometimes understood nothing as they used to speak very fast and used some informal words like guys, what’s up, rocking… etc. I found myself confused several times but it provided me a kind of opportunity of ear training. I used to open dictionary or ask to my teachers for those words, sounds and phrases. To sum up, radio is my first inspiring coach for English language learning. Not only that, it encouraged me to choose English as a major subject. Now, people get diverse access to the means of learning such as YouTube videos, social media (Facebook, Messenger, and Imo), online courses, etc. Popularity of the radio has been sharply decreased as it has been replaced by new technologies. I think these new technologies have brought massive opportunities and exposures for learning English and many other things around the globe. Therefore, we should seize the offers and make the full ultilisation of them. However, I still believe that there are places in Nepal where people have to still rely on radio for learning, information and entertainment the way I did during my school life. 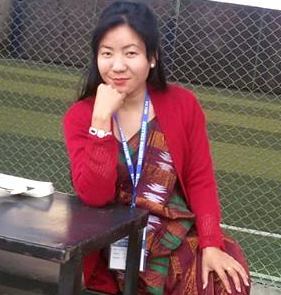 *Sreejana Chamling is the student of M.Ed fourth semester in the Central Department, TU. Her area of interests includes research in education and teaching. I received the information about reflective writing workshop in the messenger a few days before the event through Jeevan Karki. We were asked to be there with our laptops. Finally, the day came. I and my friend headed towards the program venue. Before we reached there, many of the participants had already been there. Mr Jeevan Karki and Dr Karna Rana were busy arranging furniture and other stuff in the hall. We exchanged our greetings. We were approximately 20 participants there. The first activity was the opening session. One of the facilitators welcomed us and talked very briefly about the topic and its objectives and the benefits for the participants using power points. Then in the next activity was the introductory session and scene setting, led by the next facilitator. We all became excited when the facilitator came along with some pieces of paper on his hands. He told us to pick one piece of paper each and find our pair. Everybody became busy to find their pair. I happened to pick the digit 9 and began to search my pair but I couldn’t find anyone. When none of them in the hall had the digit 9. Then the facilitator asked me to pause as someone was on the way. I waited for a while. I could see all the participants were seated with their pairs. After a few minutes, a young gentleman with a shiny beard appeared at the door. I guessed he was my pair. Fortunately, he was placed next to me as my pair. The climate setting was over. One by one the peer began to introduce their partner. We did the same. After that, the facilitator asked us to reflect on ‘self’ and select the best wearing of our own. We were provided one minute to reflect on. The facilitator threw some questions: What do you like the most? Why do you like it most? How do you feel on that particular wearing? We had to answer those questions. Everybody began to reflect, and so did I. The facilitator asked us to share the idea we had on our mind. At that point, the environment remained quiet. No one spoke. Later the facilitator himself reflected on his wearing. On his reflection, he found the muffler the best on his body. He described it and he focused on its colour and comfy quality. After the demo, many voices came aloud. Many hands were raised to share their ideas. I listened to them attentively. Their choices were varied as jackets, shoes, scarfs and so on. It sounded really interesting. The next session was the discussion on ‘why to write?’ The facilitator raised the same question for the audience. Everybody started thinking about the question. Suddenly, the facilitator asked me “Why do you write, Muna?” I simply answered, “To express myself, my ideas…” He took more responses from other participants too. There was a variety inside varieties. Some of the responses were like to express ideas, to connect with others, to improve writing and many more. Finally, the facilitator presented some ideas that were taken from other renowned scholars. Their thoughts were stimulating for us to make habit of writing. Then the other facilitator discussed on the difference between academic writing and reflective (non-academic) writing. He discussed the differences between the two terms regarding its structure, language and flexibility. Then we had a short tea break. After the break, the other facilitator distributed a sample of reflective writing. It was about the ways of improving children reading habits in early grades. We were asked to read and find a few strengths and areas of improvement in it. Everyone started reading it. The text was so long that I couldn’t catch it. I was unable to understand it though I read it twice. Perhaps, my eyes just ran over the unintelligible text. After some time, the facilitator started collecting responses. I completely remained silent as I didn’t have to say anything. The fact was that I didn’t understand the whole text. Likewise, the second sample was given to us. It was about the author’s experience of learning the English language. That text was clearer and easier than the previous one. I enjoyed while reading it. I also noted the strengths and areas of improvement regarding the text. Then, the facilitator presented the context setting for writing. He talked about the possible context i.e. striking moments, habits, college, and profession to reflect in writing. He told us that our lived experiences in those contexts can be turned into a good piece of writing. The context can be created around what, when, who, where, how and why structure. Further, another facilitator talked about the frame of the reflective writing. He mentioned it into three facets: action, reaction and reflection. The framework was figurative and expressive which I liked a lot. Further, he also talked about how to write a reflective essay. He said that a good piece of writing requires a rigorous furnishing. According to him, good writing possesses several steps: write, self-review, peer-review, review and finalise the writing. I came to know that writing is an art which is possible through devotion. He also shed light on the three major aspects that the writer should be aware of viz, issue, language and style. He said that before writing any piece of text we need to choose the issue/area on which we are going to write. The issue should be unique and draw the attention of readers. Then we need to make a framework of writing and read the related literature to collect ideas. At that moment I thought that a good writer is a good reader; a reader who can make of the writing and sees a frame in writing so that she can develop a piece of writing herself. Then it was the time for a short break. We had some snacks during the period. After the break, the facilitators highlighted the eight habits of a good writer. A good writer is also a good reader and a good listener is the striking one for me. A writer can write effectively after reading enough, listening carefully to others and observing the context. Then he asked us to transform the theory into practice by writing a reflective essay in the workshop itself. They asked us to reflect our own past and remember the most influential event that had happened in our lives and turn it into writing. Everyone opened their laptops and began writing something. I was still busy to recall the past and choosing an issue to write. Many things came in my mind, but one incident drew my attention. The incident was about saving a mother cow from sinking. I began to write, ‘last year…’ After forty-five minutes, we were asked to submit the writing. Then facilitator taught us how to make comment on others’ writing in an electronic copy. He displayed that on the projector and we were asked to follow the process and practice. I became happy to learn about the practical knowledge which I was wondering before. Finally, the facilitators collected the feedback from us and the event was formally closed. Finally, I concluded my day as a productive one. The best part of the workshop for me was the introductory part. In this part, we had a pair to introduce each other. It sounds simple but that thrilled me a lot that day. Next is the graphics. I really liked the design of power points. The power points were full of pictures and drawings that caught my attention. Likewise, I also liked the feedback collection method. That was really wonderful. Most of all the workshop stimulated me to write something and hence, you are reading this piece now. To sum with some feedback for the workshop, it would be more effective if it could start on time. We were in a sort of rush towards the end, which could have been avoided had it been started in time. We were many participants in the program. It would be more interesting if different activities like pair work and group were organised. For example, the session ‘sample of reflective writing’ was so pressurising for every participant, I think. I could see that all the participants were feeling hard to find the ideas. I myself was feeling empty. Had that work been done in a group, it would have been easier to discover many more things. In the same way, it would have been better if the writing of the participants was exchanged among the participants to get constructive comments. Critical comments and exchanging ideas are essential parts of good writing. As a whole, the motive of the event was praiseworthy. It brought ELT students and ELT practitioners together to equip them with some skills of writing and motivate them to reflect and write. *Rai is the Master’s student at the central department of education, Tribhuvan University, Nepal. She is also a life member of NELTA since 2015.